Roars of engines, fans from all over the world, shuttle buses, f1 merchandise, beautiful pit lane women, tropical heat and humidity, palm trees, overpriced food and drinks-yes, it’s the 2013 formula 1 Malaysian Grand Prix at Sepang International Circuit located in Sepang, about 50 minutes from the capital Kuala Lumpur. It’s one of the biggest sporting events, drawing thousands of spectators all over the world. This lavish sport is also one of the most expensive sports in the world. The budget of the participating teams may reach up to billions of dollars. 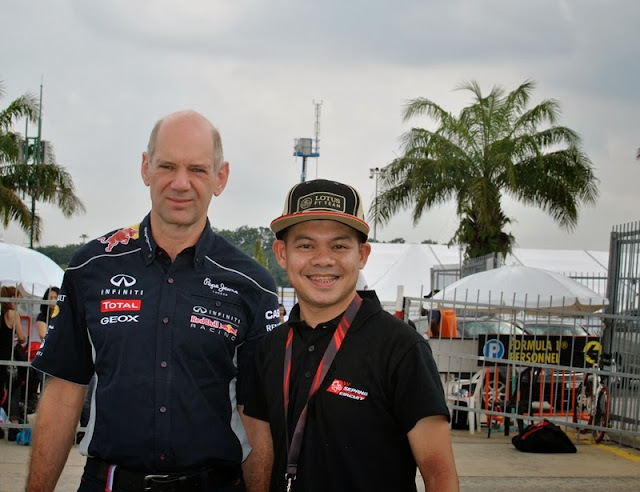 Malaysia is one of the fortunate countries in the world to have the privilege of hosting this prestigious event-and me-as a huge F1 fan-took this opportunity since Kuala Lumpur is very near Bangkok, the place where I’m residing. Every F1 fan dreams of watching a live, actual race at least once in their lifetime-and I was so blessed when that dream turned into reality. I arrived Friday early morning in LCCT terminal. That day was the Final Practice 1 and 2. At about 8 am I headed to the circuit, excited eh? The practices will start at 10am. Upon arriving at the circuit, my excitement and amazement was indescribable-I was now standing in one of the circuits ready to witness live a sport that I can just able to watch on TV before. It definitely is a dream come true. After checking out some of the merchandise and attractions outside, meeting fellow Lotus and Kimi Raikkonen fans, I went to the main grandstand. 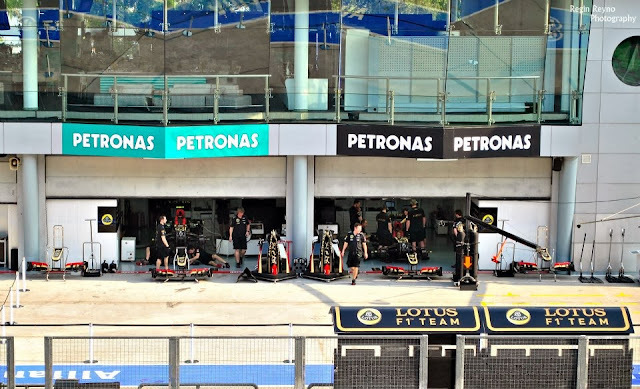 Practice sessions allow you to seat anywhere you want and in the main grandstand, you can see the teams’ garage and the pit lane. I was able to see for the first time, Lotus F1 Team, my favorite team while they were preparing the car of my favorite driver, the fastest driver in the planet right now, Kimi Raikkonen of Finland. As they were preparing the cars, roars of f1 v8 engines were heard. It’s my first time to hear an f1 engine. The feeling was indescribable. I can’t believe I was there. Then at 10 am, after the Mercedes Benz safety car did a lap, f1 cars started to get out of the pit lane and did some laps. Max Chilton of Marussia F1 Team came out first. The sound of the engine as the throttle was being pressed is like a sound of a fighter jet. I was deafened as it passed by the straight circuit in front of us. I didn't know that you need to wear earplugs when in that place. The rest of the cars followed and it was a great day witnessing the fastest race cars in the world. Mark Webber of Redbull Racing was the fastest on FP1 and Kimi Raikkonen of Lotus clocked the fastest time on FP2. On Sat. FP3 and qualifying, it was a Sabbath day and I didn't go to the circuit but rested instead. Then came Sunday-raceday! Again,I went early to the circuit early morning at about 8am hoping to try the free karting, rally, drift, and ATV that the event offers. The races will start at 4pm. But I changed my mind and decided to follow the advice of the friend, who is one of the official photographers of the event-I went to see personally the f1 drivers. F1 drivers are known to be one of the most physically and mentally fit. The sport demands lots of mental and physical exertion, and because of that, I admire f1 drivers for their talent and extraordinary abilities. So seeing them personally is a great experience. 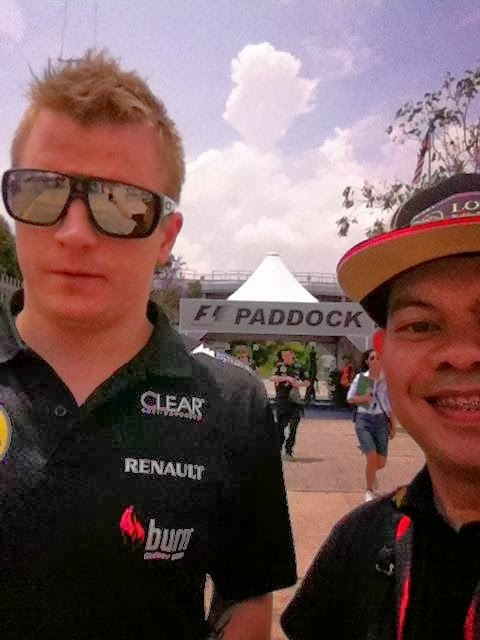 I was able to see most of the f1 drivers that day and even talked to them. The highlight of it was when I saw my favorite driver Kimi Raikkonen and Filipino-American Nicole Scherzinger, who went to the race to support her then-boyfriend Lewis Hamilton of Mercedez. I was able to talk to Nicole but wasn’t able to talk to Kimi as he was walking very fast and trying to avoid interviews and autographs. As what he said, the only thing he cares about f1 is racing. That’s Kimi. It was a wonderful experience meeting these guys. I also met team principals, and some of the crew and engineers who run the teams. At 3:00pm I went to my place ready to see the action. 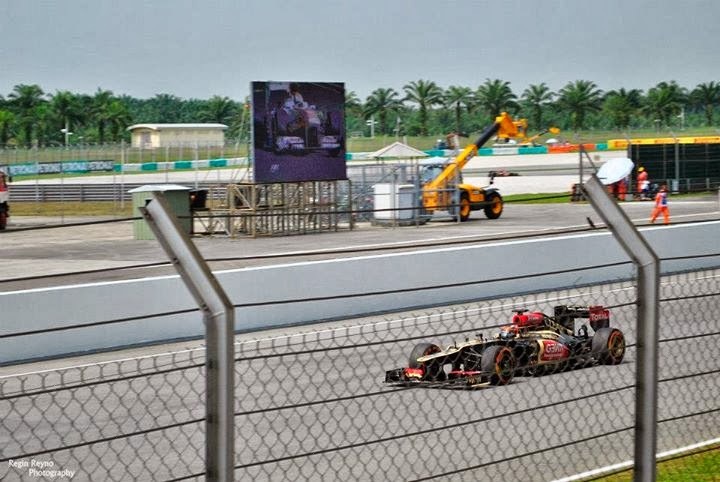 Then the lights went out and goes the 2013 Malaysian Grand Prix! It was drizzling a little bit that cloudy Sunday afternoon. Nevertheless, the race was still exciting. After 1 ½ hours of awesome race experience, the chequered flag was waved and Sebastian Vettel of Redbull Racing won, albeit disobeying team orders. It was one of the highlights of my experiences this year-a blessing indeed. I joined the thousands of people walking-not to the podium celebration-but to board the shuttle bus to the airport as I have a plane to catch. I missed the Guns n’ Roses concert that Sunday night. But it’s all good. I just witnessed a live f1 race, and it is all that matters. Have you watched an F1 race? Where was it? Share your experience.